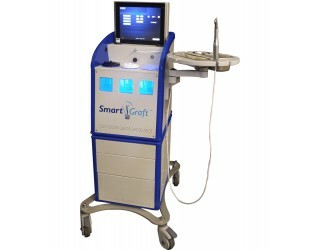 SmartGraft uses FUE (follicular unit extraction) technology which can be one simplest solution for hair loss in both men and women. The SmartGraft system was developed by a leading team of physicians, medical scientists, and engineers who understood the importance of helping to assist physicians with their FUE surgeries to give patients an alternative to the visible linear scarring that occurs with the traditional strip method. SmartGraft uses a less intrusive method to restore hair loss than the strip method. Through a process known as “fue hair restoration,” SmartGraft uses your own hair to produce the most natural results. The procedure is completed in-office, during a single visit, which means less discomfort and less recovery. And the best part? SmartGraft produces permanent results.